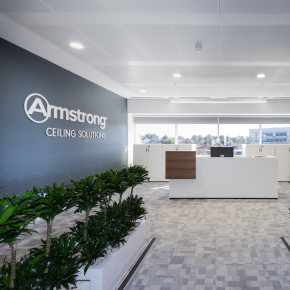 Armstrong Ceiling Solutions has recently moved offices, now showcasing its systems at its new European headquarters – Harman House. 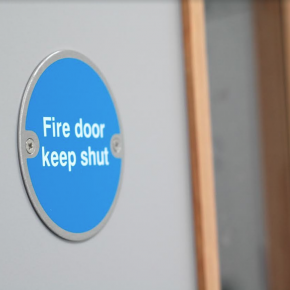 The open-plan 9,000ft2 office benefits from breakout areas, informal and formal meeting areas, and a reception – maximising collaboration in open areas and providing extra privacy when required. 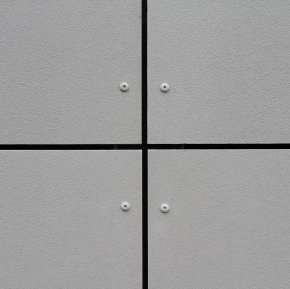 Area designed and fitted out the new headquarters with B-H300 metal tiles on a 200m wide C-Profile grid in the reception area, MicroLook 8 metal lay-in tiles on a Prelude 15 grid in the breakout areas, and TechZone and Ultima+ mineral tiles in boardrooms. 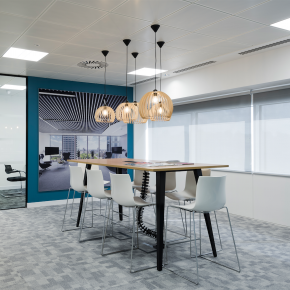 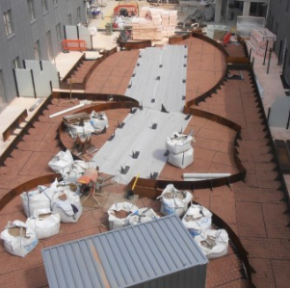 Armstrong’s TrioGuard system also features in the reception and breakout spaces, to optimise acoustics and natural light whilst providing a high-performance dirt-resistant coating for metal ceiling tiles.